Pizza is a family favorite at our house so for our 2nd Farmers Market dinner I thought I would go with something that I already know they like. Last week on our visit to the Kennilworth Farmers Market one of the items we got was spinach. Spinach is one of those foods that was ruined for me by morning sickness and one I have never been able to get the girls to eat. I was hoping that by layering it between tomato sauce and cheese we would all eat it without noticing. For the base of our pizza we used Naan, an Indian flat bread, that we bought at the store. The Bee helped me spread the tomato sauce on. We then layered the spinach and cheese before placing it in a 375 degree oven on a baking sheet. After about 12 minutes the pizza was ready. The verdict: the big taste testers (that would be the grown-ups) gave it 2 thumbs up, the Bee cleaned her plate and gave it two thumbs up. 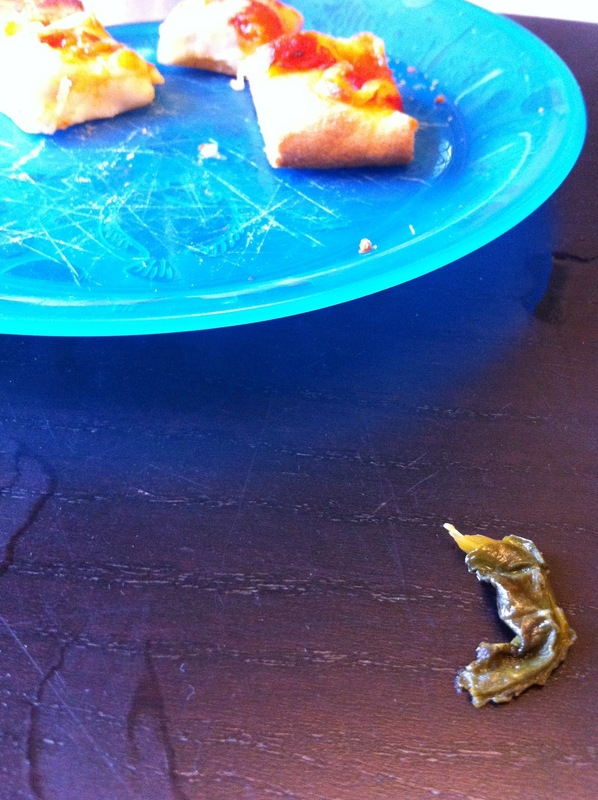 The Bean ate a few pieces before discovering the spinach and carefully removing it from each piece. My guess is she probably not a fan.